The Fire Belly Newt comes from Japan and parts of China. The natural habitat of the Fire Belly Newt is in cool, still heavily vegetated ponds, spending most of their time in water. 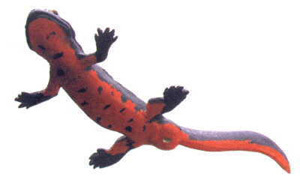 The Japanese Fire Belly Newt is very similar to the Chinese Fire Belly Newt. The Chinese has an orange coloring underneath and is usually a darker color on top. The Japanese Newt is slightly larger reaching an average size of 4 to 6 inches in length. They have grainy skin, usualy dark brown or black and generally red speckled bellies although other colorations are sometimes seen. Adult males can be easily distinguished from females by comparing the tails, male's tails have a purple tint, are flatter and usually end in a thread-like attachment. These newts are good for people new to amphibians as pets because they are readily available, and don't require a lot of specialized care. Diet - Bloodworms, frozen or live, earthworms (chopped), brine shrimp, glass shrimp, daphnia, and freeze-dried tubifex cubes. Floating reptile/amphibian sticks can also be fed, although many newts refuse them. Larger newts may eat feeder guppies if offered. - learn "how to raise feeder foods"
Feeding - Fire bellied newts do not have to be fed every day - every other day or every three days is often enough. It may take a little experimentation to figure out how much and how often they should be fed, but you can try to judge by their growth and body condition (fat or skinny) and whether excess food is being left (which will cause toxins to build up in the tank). Housing - A 20 gallon tank should be sufficient and may hold several newts. Substrate - The bottom of the tank can be lined with smooth gravel, which should be large enough that the newts can not swallow it. Provide lots of plants (the live ones are nicer than plastic and easy to care for, although a fluorescent light fixture with a plant bulb should be provided). Habitat - Housing for fire bellied newts is not difficult to provide, remember these newts are largely aquatic, but they should be provided with a land area which they can climb out on to rest and bask The land area can be provided by sloping gravel up to one end of the tank, or sectioning off a land area with Plexiglas set in place with aquarium grade silicone. Rocks, moss, and pieces of bark can be used to make a land area with hiding places if desired. A floating island of wood or rocks (which should be fairly smooth to prevent damaging delicate skin on newt bellies) is sufficient for a land area. The bottom of the tank can be lined with smooth gravel, which should be large enough that the newts cannot swallow it. Provide lots of plants (the live ones are nicer than plastic and easy to care for, although a fluorescent light fixture with a plant bulb should be provided). 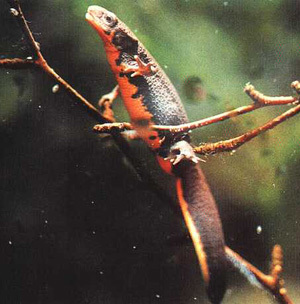 Temperature - Fire bellied newts do best at temperatures 68 - 70 degrees F (21 C). At temperatures around 75 F (24 C) or higher, they will be stressed and susceptible to infections, particularly fungal infections. Lighting - Newts should be kept on a light/dark cycle that is regular. 12 hours light/12 hours dark is probably sufficient if you are providing light, or simply allow them normal daylight in a well lit room - as long as their tank isn't in direct sunlight. Newts do not have any requirement for special UV light fixtures, but a low watt fluorescent fixture can be used if you have live plants in the tank. Just make sure the newts have a shaded or sheltered area available in the tank. Habitat Maintenance - Approximately 1/3 of the volume of water in the tank should be removed and replaced with fresh, dechlorinated water every 1-2 weeks (depending on the size of the tank and the number of newts - it should be done more often for smaller tanks and larger numbers of newts). A gravel washer is an inexpensive tool available at pet stores that allows the gravel to be gently agitated and cleaned while siphoning off water. Breeding Tips: In the wild, Fire Belly Newts will often breed after resting during the cool season. It is recommended to duplicate this when attempting to breed in captivity. Prior to breeding, it is recommended to lower tank temperatures to 40 degrees Fahrenheit. Breeding tanks must be equipped with plants. Once ready to breed, temperatures should be increased. Males will initiate breeding by fanning their tail at the female. The fanning motion releases pheromones to attract the female. Once the female is interested, the male will hold the female around the neck; a process called "amplexus". The male will then drop a spermatophore on the ground and move the female over it. The female will then take the spermatophore into her cloaca. Once pregnant, the female will deposit her eggs on the plants within the tank. The eggs are fairly large and easy to see. The eggs will take somewhere between 12 and 17 days to hatch. Rearing Larvae - Eggs will hatch within 2-3 weeks. The larvae are carnivorous from the time they have absorbed their yolk, a few days after hatching. From then on, it is necessary to provide them with live food. Good foods are Cyclops and baby Daphnia. Cyclops can often be unknowingly cultivated in aquatic setups- the parents' tank may contain some which can be used to feed the young larvae. As the larvae grow, they will take larger Daphnia, whiteworm, and bloodworm. Some people have have success feeding them on non-live food, using frozen bloodworm or even fish pellets. It is critical to provide enough food - larvae should be fed daily where possible, though adults may be fed only twice a week. Large larvae are extremely voracious, and will attack each other if underfed or overcrowded. Metamorphosis - Metamorphosis takes place within 8-16 weeks, depending on food supply and temperature, at a size of 5-8 cm (2-3 inches). Metamorphs should be allowed to leave the water at least partially, in order to prevent drowning. If it is desired to raise them aquatically, it is usually sufficient to keep them in a predominantly aquatic setup, and feed in the water - they will grow used to staying in the water. They can, of course, live terrestrially, as they would in nature. Feeding and housing is essentially identical to that of the adults, though smaller food must obviously be provided. Young newts can eat very large quantities of food, and if fed sufficiently, may grow to adult size in one year. Two years is a more common time to reach adult size in captivity. As with all pets in this category, it is important that you find a veterinarian that practices in EXOTICS – this is critical. The typical small animal practitioner may not have sufficient knowledge in this area. Even this guide is general in nature and should not be used to diagnose your pet.